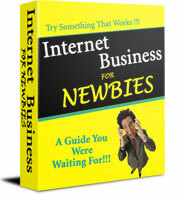 With “Internet Business for Newbies,” you will learn the ropes of Internet marketing. With this powerful eBook, you will discover how easy it is to break into the Internet marketing industry. You will also learn how easy it is to make a killer income in this industry. Quite your day job and start a new career from home using this eBook.